6 of the 24 ounce Polish Wyrob are a fresh pack whole pickle made in the Polish style. From Charles Durham of Murfreesboro, Tennessee on 3/14/2019 . 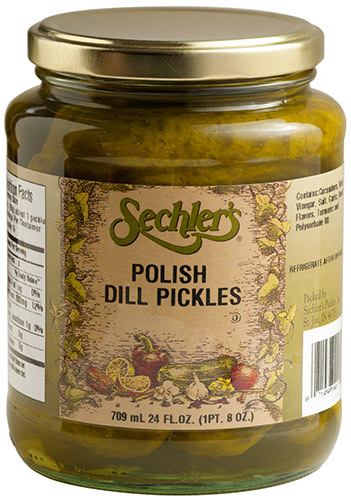 Sechler's Polish Pickles are crunchy, flavorful, and a pleasure to enjoy. When we discovered that we could not get Polski Wyrobs in the grocery store anymore, we sought an alternative. We hit upon Sechler's and have not been disappointed; in fact, we have been delighted. We highly recommend this product to anyone who has a taste for true Polish pickles. From MIKE KENNEDY of indianapolis, Indiana on 10/4/2015 . NOT OVERPOWERING LIKE SOME POLISH DILLS. ALWAYS FIRM AND FRESH TASTING. From Waddell of Reed City, Michigan on 6/13/2014 . I was looking for Polish pickles online, and came across Sechlers. We ordered 12 jars and they were gone in a month.We have since reordered another 12 jars, we have made Sechlers Polish Wyrob THE only pickle in our house. EXCELLENT pickle.